• Book Fairs: Supervise and organize the German book fairs. 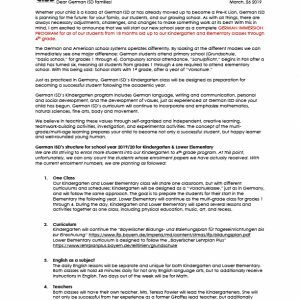 • Classroom Support: Assist with classroom activities and holiday parties. • End of the Year Party: Organize a fun afternoon following the Pre-K graduation. 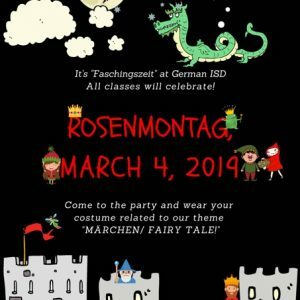 • Family Fun Nights: Oversee evening events held throughout the year with various fun, educational, family-engaging themes (new to German ISD). • Field Day: Recruit volunteers and provide kids with a cool treat during this fun day. • Field Trip Support: Assist with any field trips throughout the year. 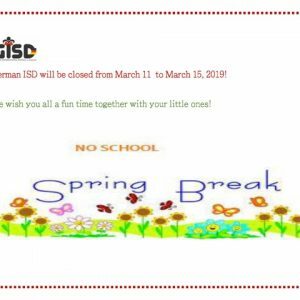 • Grand Friends Day: Encourage and facilitate communication through parents and grandparents and other relatives/family members to participate in fun bonding and learning activities at German ISD during this springtime event. • Halloween: Recruit volunteers to plan and organize the event for students, while teachers are in charge of the events during the day. • Handyman/woman: Recruit volunteers for small tasks, which are always needed! • Holiday Bazaar/Weihnachtsmarkt: Collect items for raffle/silent auctions. Find volunteers to plan and organize the event (prep work, during event & clean up). • Landscaping: Maintain the landscaping and our playground. • Mother’s Day: Help in each classroom and assist the teachers. • Open House: Advertise our school to the community. • Sanitizing classroom furniture/toys: Completed weekly by volunteers (list is posted on each entrance door). • Spirit wear: Sell German ISD spirit items (e.g., T-shirts, bags) at the school and school events. • Summer Meet & Greet/Easter: Organize German ISD annual gatherings for families. • Teacher/Staff Appreciation: Organize staff recognition and appreciation for their hard work throughout the year.